Plexidor Pet Doors: Does your cat ignore you? Some cats are affectionate on the border to intense and crave their human's attention, but most have a talent for appearing aloof and non caring. That doesn't mean they don't love us. Many cats act like they don't care, but it is just that: an act. In the wild it's wise to hide any signs of weakness. Predators and competitors are watching, and self preservation instinct says appearing aloof, uncaring, and healthy increases the odds of survival. Cats have evolved not to be demonstrative. On the other side of the coin, cats have cohabited with humans for thousands of years. No one know exactly how long, but cats have shared our lives for at least 9,000 years. During all this time, domestic cats have developed an ability to understand humans and to communicate with us. 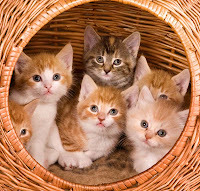 Many adult cats behave like kittens around their humans, and many cat lovers treat their cats like babies. We might think they're ignoring us, but they're paying attention. The Internet is another interesting example of the relationship between cats and humans. Even people who don't have cats enjoy silly cat videos and memes of cats that can "has cheezeburger." There are many interesting theories about why we're so interested in watching cats, including them triggering deep nurturing instincts in humans through their big eyes, small noses, and dome-shaped heads. Another theory claims that cats are cool, effortless, and don't care what we think about them, which triggers admiration. Do you have a cat? Aloof, affectionate, or a mix? Do you watch a lot of cat videos online? Cats are a species that always keep one guessing what they are really up to! Right! They turn quickly from, "I love you so much, you're the best thing ever" to "Leave me alone, and I mean right now!" lol!